I can't believe the holidays are so close. I've just ordered Kenzie's birthday supplies for her party at her preschool. All the other kids have birthday celebrations there (with lucky stay at home moms who throw a bash) so I need to take a day off work and surprise her. A Christmas baby needs at least 2 distinct parties right? 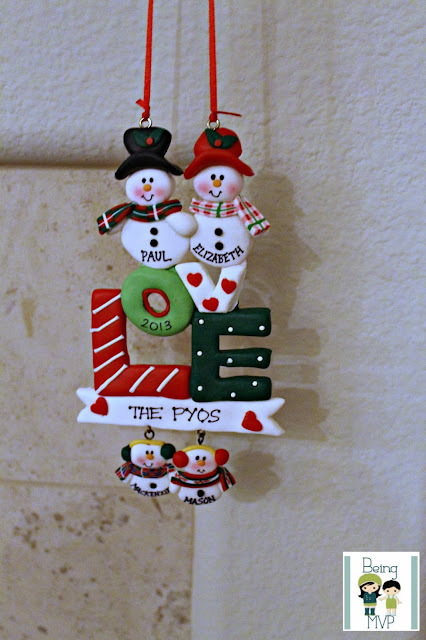 A wonderful tradition to start is making personalized ornaments each year and I am so happy to add to our ornament of last year, a lovely Snow Family Love Christmas Ornament with 2 Children, that we received for review from Ornaments with Love. This ornament can be personalized with one to four children. It's child friendly as it's made out of clay dough. I do not have to worry about it being broken when handled by the children. I love how colorful it is and perfectly reflects our wee family. This would also be a lovely gift for grandparents. Buy It: You can purchase the Personalized Snow Family Love Christmas Ornament with 2 Children for $15.99. These are really cute! I'm going to get one personalized for my son's first christmas! what a cute ornament! i love it and love that it is made out of clay! Our family is continuously growing so this will be a great idea to give to the grandparents!